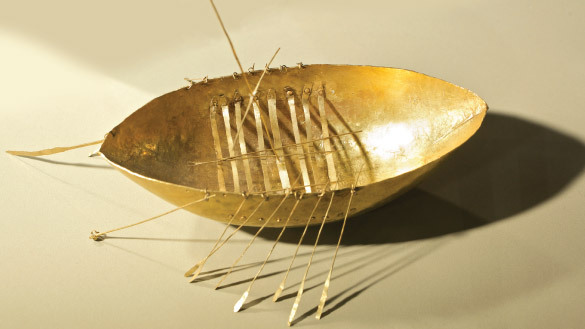 This delightful gold model-boat, just under 20cm long but rich in detail, is a rare thing in early Irish art: a realistic depiction of a real object. It appears to be a precise model of an ocean-going vessel, probably wooden but possibly made of hide. The boat originally had nine benches for the rowers and eighteen oars with rowlocks, a long oar for steering at the stern, three forked barge-poles, a grappling-iron or anchor and a mast. This might have been the kind of boat in which Irish people traded with Britain and western Europe, bringing back not only goods but also ideas, technologies and fashions. The realism of the boat does not mean, however, that it was not also symbolic. It was contained in a hoard of gold objects found in what had once been a salt-marsh on the shore at Lough Foyle, in Broighter, Co. Derry. The hoard might have been a votive offering to the sea god Manannán Mac Lir. The sea was, as it still is today, an unpredictable force. Manannán, who ruled his otherworld kingdom and could ride out over the waves on his chariot, was the ultimate master mariner, impervious to the sea’s deadly turbulence. It is easy to understand why those who sailed in open boats like this one would seek his help and protection. Apart from the delight of the boat itself, what is striking is that the gold objects found with it are mostly imports, including two neck chains that come from the eastern Mediterranean, possibly from Roman Egypt. Ireland, which had previously been the great producer of goldwork in western Europe, is now bringing it in from the outside. What has happened to the people who once had such staggering wealth in bronze and gold? Have they been displaced by those who use the new metal, iron? One possibility is that the change from bronze and gold to iron is evidence of a shift in social power. Those lower down the social scale start to use the cheaper iron, challenging the dominance of the elites who controlled the bronze industry. It is striking that many of the early iron objects in Ireland are practical working tools, especially axes. As archaeologist John Waddell puts it, ‘it is possible that the hewers of wood rather than the yielders of swords were the beneficiaries of the new iron technology’. This may be one of the reasons why the burial of gold and bronze objects as offerings to the gods declines after 700 BC. Whatever shifts of power were taking place within Ireland, the beauty of the Broighter boat and the care lavished on its creation suggest that trade with the world beyond its shores was one of the drivers of change.